On Aug. 22, 2018, a six-alarm fire left 1,500 tenants of a Toronto apartment building at 650 Parliament Street temporarily homeless. Some displaced residents arranged to stay with friends or family, while the City and Red Cross found accommodations for others at the Regent Park Community Centre and other places. Mayor John Tory of Toronto appealed to the public to assist these individuals. 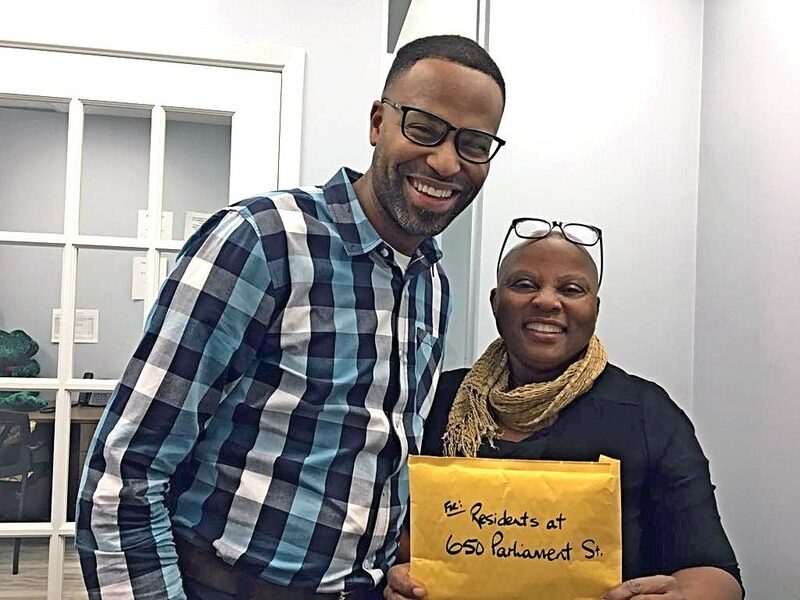 In response to the appeal, Maria McClean and John Scott, representatives of the Ontario Conference, contacted the mayor’s office, met with a staff member of the City of Toronto at a site where residents were housed, and later made a contribution of gift certificates to the intake staff at the Response Office on Wellesley Street on behalf of the conference. James Thomas, the individual who has been managing the situation onsite, expressed deep gratitude to the directors, McClean and Scott, for the conference’s contribution. Although the situation has grown cold in the news, the need is still great. Conference representatives promised to make another presentation of gift certificates before the end of the year. While at the site, the directors got a sense of the volume of work involved as employees face the ongoing and daunting task of resettling the 1,500 residents. Work is still being done on the building, and there is a heavy security presence. Please keep this initiative in your prayers. If you would like to know more, contact Maria McClean at mmcclean@nulladventistontario.org.